Lt. Hugo Broch (in the middle) in conversation with Gen.Ob. Pflugbeil on 12 March 1945 after decoration of Knight`s Cross. 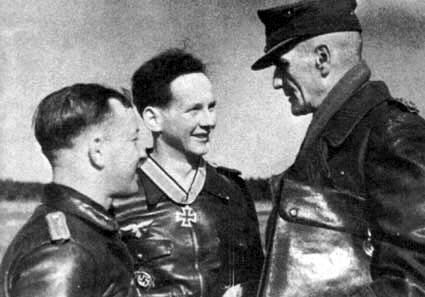 On the left is Lt. Hermann Schleinhege (96 victories, RK) commander of 8./JG 54 . Hugo Broch was born on 6 January 1922 at Leichlingen in the Bergisch-Gladbach region of Rheinprovinz. On 6 January 1943, Broche was posted to II./JG 54 on the Eastern Front. Gefreiter Broch was assigned to 6./JG 54. His first combat experiences were as Kaczmarek (wingman) to Horst Ademeit (166 victories, RK-EL) and Heinrich "Bazi" Sterr (130 victories, RK). On 13 March 1943 he shot down his first confirmed enemy aircraft having previously claimed a victory on 7 March for which he did not receive confirmation. By the end of July, he had raised his total to seven. He claimed his 20th victory on 28 August. On 27 October 1943, Broch was awarded the Ehrenpokal. He recorded his 44th victory on 6 November.  On 26 November Unteroffizier Broch received the Deutsches Kreuz in Gold. From winter until June 1944, Broch became a fighter instructor with Ergänzungs-Jagdgruppe Ost. He returned to combat duty at the beginning of August 1944. Re-assigned to 6./JG 54, he raised his victory total to 71 by the end of 1944. From November 1944 until the end of the war he flew with 8./JG 54 based mainly in the Kurland area. On 12 March 1945, after recording 79 victories, Feldwebel Broch was awarded the Ritterkreuz. Hugo Broch flew 324 combat missions and shot down 81 enemy aircraft on the Eastern Front, including 18 Sturmoviks. His score included twelve double victories and three triple victories.